Pay over the phone with your card, pop in with the cash or post us a cheque, then sit back and relax. We’ll be ready to whisk you away on your chosen tours. All departures leave from our office “SB”, and a selection also leave from the Holy Name Church in Great Barr. You can see these departures indicated with “GB” in the details listed for each trip. Please remember to book early as this will give you the option to choose your favourite seats. (Once seats have been allocated they will not be changed and must be adhered to when boarding, unless otherwise instructed by your driver). 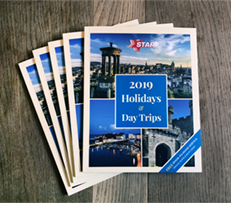 There are other Terms & Conditions relating to your booking of a Day Trip with us and these are on display in our office – or you can ask us about them at the time of booking.